Liz & Nate » We’ve Been Published! Has it really been over 2 MONTHS since we posted anything? Its not that we haven’t done anything worth posting, its just that we’re busy people. To quote Chris Gardner of ReadyMade Magazine, “Nate and Liz Gordon are busy. Like, crazy busy.” Woah! Did you see that? 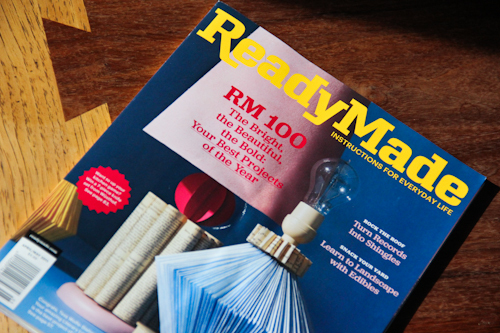 I just linked you to an interview with Nate and me on the ReadyMade website! Okay, lets back up for a second. Do you remember this post? In it, I begged anyone and everyone to visit the ReadyMade Top 100 Contest page and vote for our “Geeky Bar Top” (oh how I wish I had come up with a more inspired name for it) so that we could qualify for the contest. Well, here’s a great big THANK YOU to everyone who signed up, voted, and has subsequently been receiving random DIY emails for the last 4 months. Because not only did we qualify, we made it to the top 25! 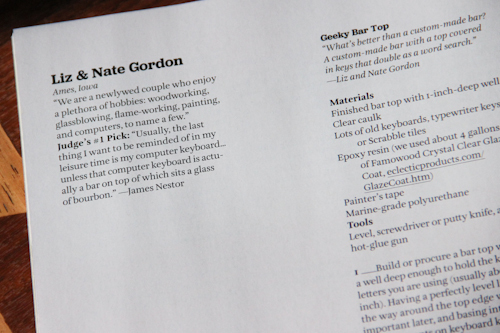 That means that they actually used our project instructions to make their own version of our Geeky Bar Top. 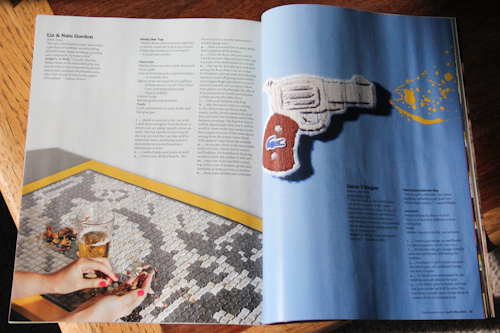 Then they put it in the current issue of ReadyMade. We’re having fun finding our names pop up all over the ReadyMade website too. Like I said earlier, we were contacted for an interview that they put on website. We also found out that we were a top pick for a couple of the judges – Eric Wilhelm, the CEO of Instructables and James Nestor, a writer from San Francisco. My favorite surprise though, was finding this video of the crew at West End Salvage in Des Moines making the bar top for the magazine. I’m pretty sure they used glass instead of resin, but the intricate pattern is amazing. 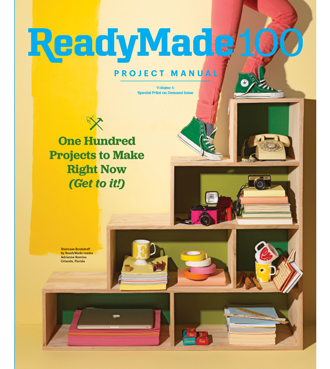 There’s also a print-on-demand book available with the entire top 100, which will hopefully be living in our new bookcases (do I smell a potential blog post from Nate?) soon. So that’s my little story about how our bar top was immortalized. And if you haven’t read Nate’s not-so-little story about the all the work that went in to the original, you can catch that in this post.